Last week, a fire broke out, at SSFL (Santa Susana Field Laboratories), burning hundreds of acres of vegetation growing in contaminated soil. That fire obviously released some of those contaminants and transported them offsite in the smoke. It is impossible to burn a contaminated site without releasing some of that contamination. Had the Responsible Parties met their obligations for full cleanup by last year, there wouldn’t be concern about the release of contamination in such a fire for those portions of SSFL that burned. And for those that didn’t, the failure to perform full cleanup as promised means continued risk any time a new fire might occur. 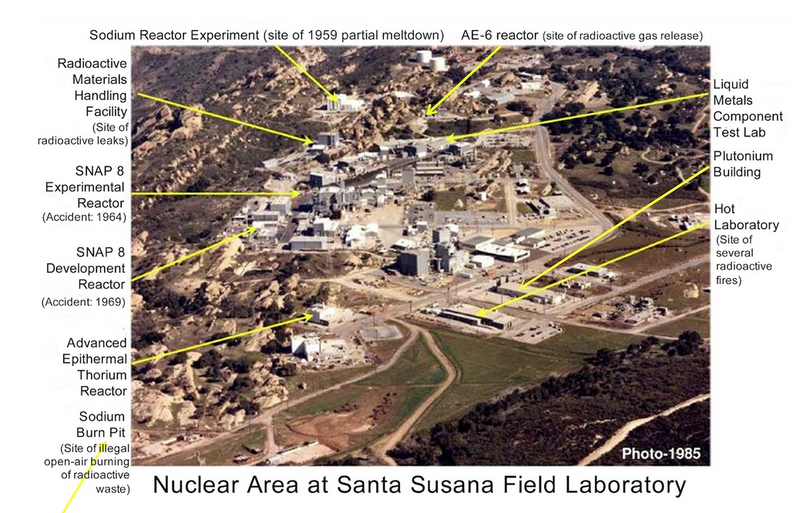 *Santa Susan Field Laboratory is the site of several nuclear meltdowns and is a SUPERFUND toxic site. The Woolsey Fire has burned a good portion of the former Santa Susana Field Lab, which was once home to a nuclear reactor and numerous rocket tests. The site is still riddled with radioactive waste and other toxic compounds. BACKGROUND: A 2012 EPA report doesn’t paint a pretty picture. Approximately one out of every seven samples contained “concentrations of radioactive materials exceeding background levels.” More than 80% of these were man-made radionuclides. This echoes a 1989 Department of Energy report found that there were contaminants in both the soil and the plants. Local, state and federal agencies have inspected the Santa Susana Field Laboratory and found that the nuclear Superfund site was not impacted by the Woolsey Fire. The Santa Susana Field Laboratory is a complex of industrial research and development facilities located on a 2,668-acre (1,080 ha) portion of the Southern California Simi Hills in Simi Valley, California. It was used mainly for the development and testing of liquid-propellant rocket engines for the United States space program from 1949 to 2006, nuclear reactors from 1953 to 1980 and the operation of a U.S. government-sponsored liquid metals research center from 1966 to 1998. The site is located approximately 7 miles (11 km) northwest from the community of Canoga Park and approximately 30 miles (48 km) northwest of Downtown Los Angeles. Sage Ranch Park is adjacent on part of the northern boundary and the community of Bell Canyon along the entire southern boundary. Throughout the years, about ten low-power nuclear reactors operated at SSFL, in addition to several “critical facilities” that helped develop nuclear science and applications. At least four of the ten nuclear reactors had accidents during their operation. The reactors located on the grounds of SSFL were considered experimental, and therefore, had no containment structures. The site ceased research and development operations in 2006. The years of rocket testing, nuclear reactor testing, and liquid metal research have left the site “significantly contaminated”. Environmental cleanup is ongoing. THIS LOCATION IS A SUPER FUND CONTAMINATED SITE. Three years later, the Nuclear Regulatory Commission has yet to act on the lessons from Fukushima. Tell the NRC to re-evaluate safety before re-licensing any nuclear reactors. He stays to help take care of the animals left behind. Woods Hole has begun a project to document cesium contamination levels across the Pacific over time. 13 years ago a trial occurred to determine if Martin Luther King Jr. was murdered. In 1999 they found government agencies guilty of murdering him. Do your own research and find out more … spread the word.